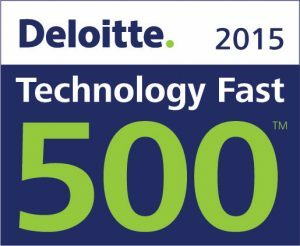 Overall, 2015 Technology Fast 500™ companies achieved revenue growth ranging from 109 percent to 21,984 percent from 2011-2014, with an average growth rate of 850 percent. Technology Fast 500, conducted by Deloitte & Touche LLP, provides a ranking of the fastest growing technology, media, telecommunications, life sciences and energy tech companies – both public and private – in North America.Technology Fast 500 award winners are selected based on percentage fiscal year revenue growth from 2011 to 2014. In order to be eligible for Technology Fast 500 recognition, companies must own proprietary intellectual property or technology that is sold to customers in products that contribute to a majority of the company’s operating revenues. Companies must have base-year operating revenues of at least $50,000 USD or CD, and current-year operating revenues of at least $5 million USD or CD. Additionally, companies must be in business for a minimum of four years, and be headquartered within North America. SourceKnowledge is a leading programmatic video platform that measures success based on post-click behavior. Delivering over 250 million global video streams daily, SourceKnowledge is a top 10 video ad marketplace (comScore) that ensures brand safety, viewability and the best return on ad spend by targeting audiences intelligently using data across mobile, tablets, web browsers, and connected TVs. SourceKnowledge integrates with leading supply-side partners to segment, retarget, and engage consumers with personalized interactive video and display ads that drive transactions. SourceKnowledge is headquartered in Montreal with offices in Vancouver and clients around the world.